SAM-500D - Sundown Audio Monoblock 500W RMS Micro Amplifier. 1-Ohm 500w RMS. Multi-way Protection Circuitry (Thermal/Over Current/Speaker Short/Speaker DC Protection). Variable Bass Boost: 0-9dB. Input Sensitivity: 15V-0.5V. 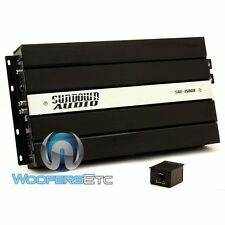 SAE-1000D v2 - Sundown Audio Monoblock 1000W RMS Digital Class D Amplifier. Digital Class-D Linkable Monoblock Amplifier. RMS Power 1-Ohm Mono: 1000W. RMS Power 2-Ohms Linked: 2000W. RMS Power 2-Ohm Mono: 500W. SAE-2000D - Sundown Audio Monoblock 2000W RMS Class D Amplifier. Multi-Wat Protection Circuitry (Thermal, Over-current, Spearer Short, Spearer DC Protection). Variable Bass Boost: 0-12dB. RCA Input and RCA Master Output to RCA Slave Input. This is a small monoblock amplifier made by Sundown Audio. This amplifier has been fully stress tested and is fully functional. Input Sensitivity: 6 - 0.2 Volts. Efficiency 4-OIhms: 86%. THD 4-Ohms: <0.5%. 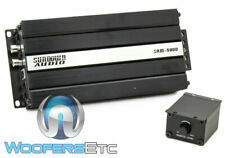 SAE-1500D - Sundown Audio Monoblock 1500W RMS Digital Class D Amplifier. 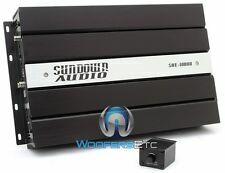 Sundown Audio SAE-1500D Monoblock 1500W RMS Digital Class D Amplifier. RMS at 1 ohm : 1500-watts. RMS at 2 ohms : 800-watts. RMS at 4 ohms : 400-watts. SAE-600D - Sundown Audio Monoblock 600W RMS Digital Class D Amplifier. Digital Class-D Linkable Monoblock Amplifier. RMS Power 1-Ohm Mono: 600W. RMS Power 2-Ohms Linked: 1000W. RMS Power 2-Ohm Mono: 300W. SAE-3000D - Sundown Audio Monoblock 3000W RMS Digital Class D Amplifier. RMS Power 1-Ohm Mono: 3000W. Digital Class D Linkable Monoblock Amplifier. We added the SAE-1500D in 2015; the SAE-2000D, SAE-1100.5, and SAE-100.4 in 2017; and finally the SAE-3000D in 2019. SCV-1500D - Sundown Audio Monoblock 1500W RMS Class-D Amplifier. SCV-1500D Monoblock 1500W RMS Amplifier. RMS Power - 1 ohm Mono: 1500W. RMS Power - 2 ohm Mono: 800W. RMS Power - 4 ohm Mono: 400W. Bass Boost - 45 Hz: 0 - 9 db. SCV-2000D - Sundown Audio Monoblock 2000W RMS Class-D Amplifier. SCV-2000D Monoblock 2000W RMS Amplifier. RMS Power - 1 ohm Mono: 2000W. RMS Power - 2 ohm Mono: 1000W. RMS Power - 4 ohm Mono: 500W. Bass Boost - 45 Hz: 0 - 9 db. SAZ-1000D - Sundown Audio Monoblock 1000W RMS Class-D Amplifier. 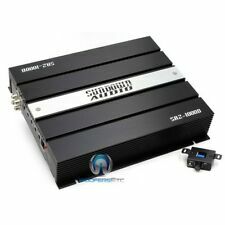 Sundown Audio SAZ-1000D 1000W 1-Channel Monoblock Amplifier. The SAZ-1000D is Sundown's most compact Class-D amplifier and can fit almost anywhere. E-10 V.3 D2 - Sundown Audio 10" 500W RMS Dual 2-Ohm EV.3 Series Subwoofer. SAE-600D - Sundown Audio Monoblock 600W RMS Digital Class D Amplifier. Working in conjunction with a motor ventilation system based on our SA series & the new, larger voice coil the third generation E series possesses thermal capacity unheard of in this class of subwoofer. (2) E-8 V.5 D4 - Sundown Audio 8" 300W RMS Dual 4-Ohm EV.5 Series Subwoofers. SAE-600D - Sundown Audio Monoblock 600W RMS Digital Class D Amplifier. E-8 V.5 D4. Digital Class-D Linkable Monoblock Amplifier. new Sundown 1500 watt amp that's very powerful this amp dyno test little over 1800 true watts. very dependable and will outlast any other amp on the market guaranteed. Pair of SA-12 D4 REV.3 - Sundown Audio 12" Dual 4-Ohm SA Series Subwoofers. SAE-2000D - Sundown Audio Monoblock 2000W RMS Class D Amplifier. The SA line was designed to be the centerpiece of the Sundown Audio sub woofer lineup -- the line to which all of their other lines are compared. SAE-600D - Sundown Audio Monoblock 600W RMS Digital Class D Amplifier. Digital Class-D Linkable Monoblock Amplifier. (2) LCS-12D4 - Sundown Audio 12" Dual 4-Ohm Subwoofers. Sundown Audio LCS-12 D4 Car Subwoofer. Pair of SA-10 D4 REV.3 - Sundown Audio 10" Dual 4-Ohm 750W RMS SA Series Subwoofers. 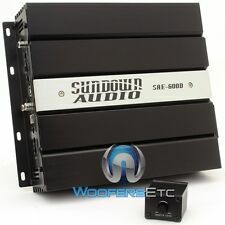 SAE-2000D - Sundown Audio Monoblock 2000W RMS Class D Amplifier. The Sundown SA series has been our most popular product line since the introduction of the SA-12 in 2009. E-12 V.3 D2 - Sundown Audio 12" 500W RMS Dual 2-Ohm EV.3 Series Subwoofer. SAE-600D - Sundown Audio Monoblock 600W RMS Digital Class D Amplifier. Working in conjunction with a motor ventilation system based on our SA series & the new, larger voice coil the third generation E series possesses thermal capacity unheard of in this class of subwoofer. E-15 V.3 D2 - Sundown Audio 15" 500W RMS Dual 2-Ohm EV.3 Series Subwoofer. SAE-600D - Sundown Audio Monoblock 600W RMS Digital Class D Amplifier. Working in conjunction with a motor ventilation system based on our SA series & the new, larger voice coil the third generation E series possesses thermal capacity unheard of in this class of subwoofer.